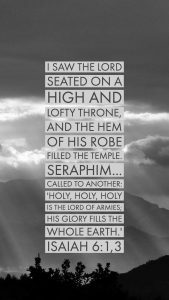 In the year that King Uzziah died, I saw the Lord seated on a high and lofty throne, and the hem of his robe filled the temple. and with two they flew. temple was filled with smoke. he had taken from the altar with tongs. the holy seed is the stump. Isaiah was the same man, who had done the same things both before His encounter with the glory of the Lord as he was in the moment of the vision. Yet, seeing the Lord’s glory, just the hem of His robe filling the temple, was like looking into a mirror where Isaiah saw the inky, sickening blackness of his own soul. In the presence of pure holiness, Isaiah’s sinful humanity became palpable to him and he cried out, very truly, “I am ruined!” As the psalmist rightly says, “If you, O Lord, should mark iniquities, O Lord, who could stand?” (Psalm 130:3) Even one sin separates us eternally as we are less than perfectly holy, let alone sins as countless as the sand on the seashore. 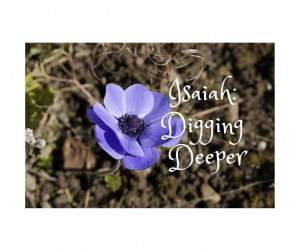 Isaiah knew he was not blameless, and he knew he didn’t need to go farther than his lips to point to see his sinfulness. A harsh word, a little lie, speech that tears down, not to mention gossip, or deception, or mockery, or hatred. To understand this verse, we need to understand the context, not just this chapter, but the history of the Jewish nation as a whole. To sum up, the Lord pursues and pursues them over generations and generations. They turn back to Him for in short spurts, but the majority of the time, they rebel and turn against the Lord with ever increasing intensity. They reject Him in small amounts at first, like when they told the prophet Samuel they didn’t want to be a theocracy (ruled by God) anymore, but they’d rather have a human king “like all the other nations” instead. (1 Samuel 8:19-20) They more they turned away from God, the greater their degree of total rejection of Him became. The prophet Hosea (a contemporary of Isaiah) was the last prophet to prophesy to the Northern Kingdom before they fell under Assyrian rule, and he described God’s people as “whores” who had forsaken Him to play the adulteress to pagan gods. (Hosea 1:5-6) In verse 9, the Lord instructs Isaiah to keep prophesying, even though they are a people who clearly do not understand the hope God is offering them. 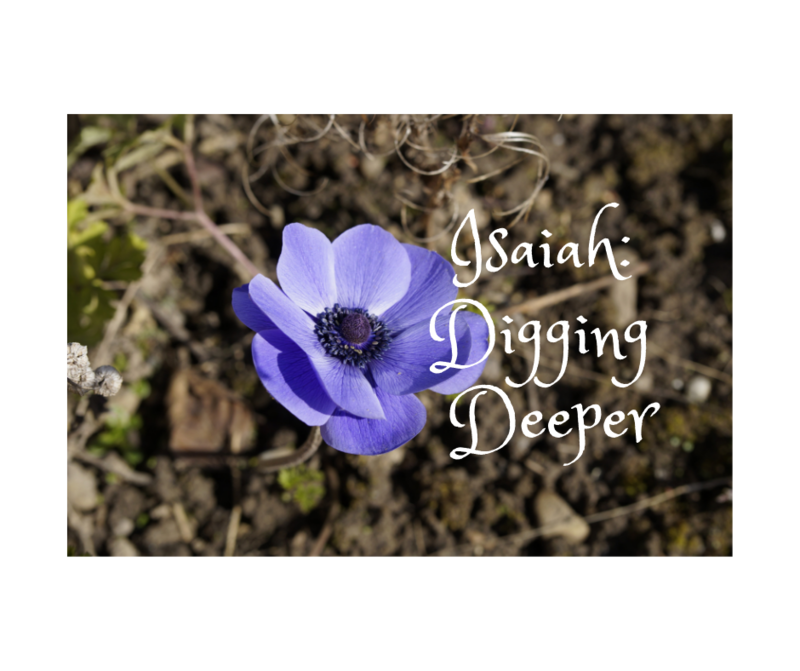 Isaiah is to prophesy, despite the fact that they are “looking” at Isaiah and his demonstrative life, but they are not perceiving what God is communicating. The natural result of hearts that persistently turn away from truth is spiritual deafness and blindness. A spiritual “numbing” happens the more one rejects truth again and again and again. God was not blinding eyes that wanted to see Him, He was grieved over their own choice to perpetually choose not to see what He wanted them so desperately to see, that He held their hope! You’ve probably seen an old tree stump cut down, yet a new green shoot poking out despite the dead exterior. This is the imagery God is giving to Isaiah in this prophecy. God spent several verses painting an exceedingly bleak picture of the Jewish nation. Though Isaiah would preach hope, they would spurn it. 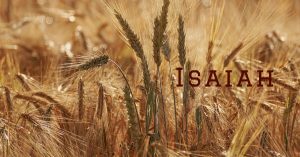 Though Isaiah was being sent with an invitation to repent, the Jews would reject it. As a result, God’s righteous consequence would come upon them and they would be decimated and removed. Even So, God would leave a tenth (not necessarily meant to be a specific number, but rather to indicate a very small percentage of the whole) of the Jewish nation, but even those would reject Him as well. Even so again, “Like the terebinth or the oak that leaves a stump when felled, the holy seed is the stump.” (verse 13) The Holy Seed is the Lord Jesus Christ who would one day come, born a Jew to save the Jews as their Promised Messiah. Jesus is the Promised Hope, even in the midst of rejection. No one can see God’s face and live (Exodus 33:20), yet Isaiah was given a glimpse of the Lord’s glory and his immediate response was woe for sinfulness. Where have you encountered the glory of the Lord? Not just a good praise song set at church, but time where you have felt so impressed around you by the awe-filling glory and majesty of the King of Kings. When have you literally fallen down prostrate before the Lord, confessing your sin because you glimpsed His holiness? Isaiah didn’t live his life inside of a vision at the temple, and we can’t live in these moments of supreme glory either, but the Lord will give them to us if we seek Him. Study the Exodus passage describing Moses and his request to “please show me Your glory!” (Exodus 33:18) and ask the Lord for the same thing. 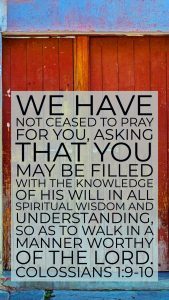 Seek His word, look for His face, pray with a hunger to know Him and see Him, and He will respond! How many times have you heard the hope of the gospel and the forgiveness offered through Jesus Christ because of His sacrifice, and still you haven’t surrendered to Him? How many times have you been convicted of a favorite sin, and chosen to keep doing it because you have every rationale in the world memorized to keep on doing it? How many times have you known exactly how you could be serving your local church, or loving that stranger, or making that change in your marriage, yet you ignore it again and again? Be on your guard! Ask God to make your heart soft to His leadings. Ask Him to open your eyes to see His truth. The more your read His Word and engage Him through prayer, the more your ears will be tuned to hearing His voice, your eyes will be looking for Him, and your heart will be ready to be shaped by His Spirit. He longs for you; He is pursuing you! Turn and let His embrace catch you! The Lord is a God of Hope in the midst of darkness. Isaiah was called to prophesy about such great coming darkness where Jews would increasingly reject Christ, but even then, God promised Hope would still come. Maybe you’ve turned a cold shoulder to God, decided you wanted to run life your own way, and in light of your past and your heart attitude, you’re pretty certain there’s not a chance God would “take you back.” If He only knew what you have done, right? Or maybe you know someone who fits those shoes. A parent, or sibling, a child, or spouse. Either way, the story of Isaiah, the rebellious Jewish nation, and God’s promise of assured hope is for YOU. As long as you are breathing, peace with God is possible because of Christ. His forgiveness is complete. His hope for life is eternal. It’s not too late to find peace and redemption through a relationship with Jesus! This is Cross Week One! It started with a stirring deep inside, like a gentle breeze playing in the leaves. I had no intention of becoming a prophet. No longing to lead God’s people through visions. He stirred as I witnessed injustice within Jerusalem. All while the religious elite carried on with endless sacrifices. He stirred as I saw Israelites offering sacrifices during pagan New Moon festivals and following other pagan rituals, each one more grotesque and vulgar than the last. Hadn’t Yahweh intended us as a light to the nations? Wasn’t His design for us to be holy and set apart? We are walking farther and farther from the ways of Yahweh, I see it everywhere. Yahweh is a jealous God; He will not continue permitting our idolatry, but what am I to do? I lift my head as I walk through Jerusalem’s streets. I see the dishonest scales in the marketplace paired with greedy gleam in the sellers’ eyes. I see the orphan’s matted hair as he reaches to steal a piece of fruit. I see the thin widow struggling to survive, shamed from the market entirely. Then I catch the scent of roasted flesh as another sacrifice is offered in the temple and I feel my stomach heave. How far we are from God’s heart! My feet run, fleeing the scene, swiftly moving beyond the gates of Jerusalem, tears blinding my eyes. “Enough, Yahweh, enough!”, I scream out into the hills of Israel’s sheep begging for mercy from His stirrings. I fall to the ground, broken for the blatant sin of my people. An eerie stillness fills the space around me and fear grips me. I dare lift my eyes from my prostrate position in the dirt. The fields of sheep have faded from view, my heart gallops within. Wind swirls around me tearing at my robes, and the sound of rushing waters tumbling powerfully over one another fills my ears. There before me, a clearing opens and I see the Lord seated on a high and lofty throne. Terror grips me, but I cannot look away. The hem of his robe fills the temple! Seraphim stand above Him; each with six wings, with two they cover their faces, with two they cover their feet, and with two they fly around and above the throne of the Lord. “Holy, Holy, Holy is the LORD of Hosts! to the rhythmic dance of the seraphim. The temple fills with the glorious smoke of the Most High’s Presence. “Woe is me for I am ruined! A seraphim flies to me with a glowing coal taken from the altar with tongs. The Lord took my sin upon Himself? He took a coal and removed my sin? But this cost me nothing! My heart burst, for here was the answer I’d been pleading for. The Lord not only removed my sin, but also gave the opportunity to be His mouthpiece to Israel! There have been many visions since that incredible day. Many words entrusted to my ear to speak on behalf of Yahweh, but none as memorable as that first one when the Lord Himself removed my sin without an animal’s lifeblood. I had given no sacrifice, yet He forgave. I’m walking the dusty sheep paths outside Jerusalem again. The bucolic scene of sheep and shepherd hold a sweet comfort for me. I’m muttering aloud key words from recent visions as they swirl around me with incessant intensity. It’s as if the message they carry is far more precious than I realize. There is weightiness here; a holiness. “My servant Messiah will be successful,” said the Lord. Raised up, exalted, but strangely, so persecuted He will become disfigured and unrecognizable. He will be despised and rejected, un-wanted and without apparent majesty. My mind flew instantly to my first vision and the awe-filled throne room where the Lord’s majesty was unmistakable. How do the prophecies fit? He would need to lay aside His rights! Unbidden, the faces of orphans, widows, and gloating marketplace thieves, swim before my eyes followed by the image of priests with bloody hands while their hearts are sold in idolatry. He will bear our sickness and carry our pains? Even these sicknesses? The ones of our inner souls? The ways we have allowed injustice? The ways we have blatantly sinned? The ways we have cheated Yahweh? Would He carry our idolatry? No, surely not. Unthinkable. Suddenly, my heart pounds, my breath catches, and I cannot stay the tears from coursing down my cheeks as the sounds of rushing waters fills my ears. the Lord’s pleasure will be accomplished. making it impossible to even breath. He will become the guilt offering! His sacrifice for our lives! Again, the image of my first vision rises up and I recall with flowing tears how I had given no sacrifice, yet He forgave. but He would purchase it with His blood. The sacrifice would be His own. Thanks for joining us today as we journeyed into Cross Week One! Don’t miss out on the discussion below – we’d love to hear your thoughts! He was a quiet man standing before a gathered few, Bible in hand and a passion in his voice that belied his calm persona. His was a new church plant in my city and me, with my meager Spanish, had decided to join them for a Sunday. His question asked, “Who are the church?” In both English and in Spanish, the grammar is incorrect, matching a plural verb with a singular noun. But the audience responded loudly, with a veritable boldness that struck me deeply. No questioning. No pause while the pastor explained what he meant. No exhortation to let the believers gathered there realize they had an identity as Christ’s Body as a whole called Church linking all believers across all culture, tribes, languages, and time through the precious blood of Christ. Simply an immediate response: Nosotros! Us! We are! To read Scripture is to hear the heartbeat of the triune God as His Spirit breathed out His inspiration to every human author. God, eternally existing in three persons, perpetually delights in beautiful community within Himself. God, the fullness of Him as Father, Son, and Spirit, longs for us to enjoy that same community between fellow believers and with Himself. Not only is our harmonious unity as believers the very desire of God, He also created our hearts to long for it as well. It’s why we want followers on Instagram and likes on Facebook, while also aching for people to really, truly know us, love us, and walk with us. Relationships, deep, meaningful ones, are important because God designed us for them. 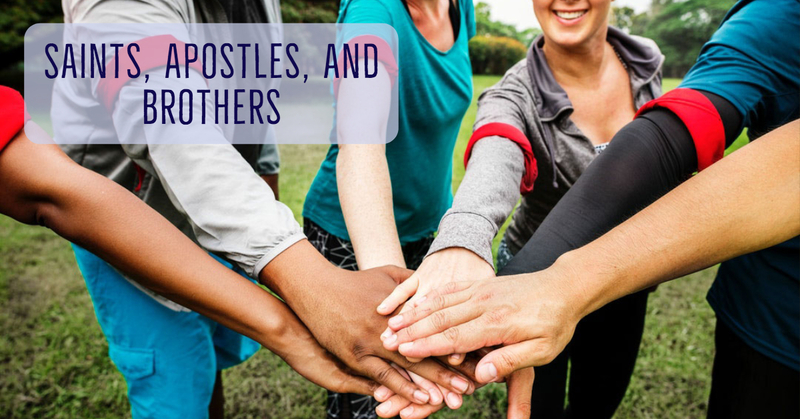 This clear need for genuine community is vividly depicted throughout the pages of Scripture from Eden to Revelation, but Paul’s letters hearken back to this theme of unity within the church again and again on repeat. As Paul opens Colossians, this grand book describing deep mysteries of the triune godhead and the centrality of Christ in all things, he humbly begins in familiar, but fundamental territory: the familial unity of all believers. Paul, an apostle by Christ. Christ, the very author and original eternal participant of community, willed that Paul would become an apostle to build His kingdom and participate in the riches of biblical community known as Church. Not named for his role in the church as pastor, or for his age, or by his abilities, but by his identity as a brother in the sacred fellowship of Church. Breathtakingly, on this stage of the greatest apostle and his coworker for the gospel, suddenly all believers are welcomed to join them. Saints and faithful brothers in Christ. Yes, this letter was originally penned to a fairly small town house church in Colossae, but it also carried instruction to have it read at other churches, broadening the scope of “saints and brothers in Colossae” to include all believers. Brothers and sisters, each of them. Paul knew his recipients weren’t blood relatives of Timothy. He didn’t declare them saints because they had all been baptized or taken communion, followed the ten commandments, or sold their belongings to give to the poor. The believers were saints and brothers in Christ. As we dive into this extraordinary letter, we will encounter incredible truths to shape our everyday life, but we must keep it all in the framework of unity within the Body of Christ. The church in Colossae was just a small gathering of believers Paul had only “heard about” from Epaphrus, another pastor Paul had likely trained and discipled from his time in Ephesus (Acts 19:8-10). There were other churches, seemingly more important ones, bigger ones in larger cities Paul had written to also, but this letter to the Colossians was preserved and accepted into the whole of Scripture. Its truths are deep and applicable to us today. As we gaze into these mysterious beauties, we must hold up the lens by which it was intended to be seen through, unity within the Church. Don’t miss out on Church, Sister! Thanks for joining us today as we journeyed into Anchored Week One! Don’t miss out on the discussion below – we’d love to hear your thoughts! Check out Awakening The Desperate! 1) How is the phrase, “For I decided to know nothing among you except Jesus Christ and Him crucified”, amplified by reading the previous chapter? 2) Where is Paul’s confidence found? 3) What is the “testimony of God”? When I came to you, brothers and sisters, announcing the mystery of God to you, I did not come with brilliance of speech or wisdom. 2 I decided to know nothing among you except Jesus Christ and him crucified. 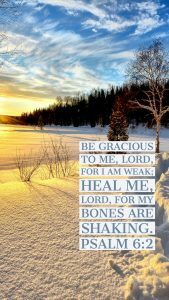 3 I came to you in weakness, in fear, and in much trembling. 4 My speech and my preaching were not with persuasive words of wisdom but with a demonstration of the Spirit’s power, 5 so that your faith might not be based on human wisdom but on God’s power. In chapter 1, Paul emphasized humanity’s wisdom and our perspective on reality compared to God’s infinitely greater wisdom and His completely whole perspective on all of eternity. The difference is so expansive, it’s laughable to even consider comparing the two. He remarks at how utterly foolish it seems for the all-powerful Being to sacrifice Himself for the souls of finite humans, yet that is exactly what God did. Paul says this wisdom of God, deemed foolish by man, is priceless beyond description because it is both the power of God and the wisdom of God combined in one sacrificial act that offered salvation to all of mankind. God’s wisdom vastly out measures our own and He used His wisdom to bring us redemption, drawing us close to Him. God went even farther and chose the weak and lowly of the world to be the mouthpieces declaring this great goodness of salvation. If that isn’t humbling, nothing is! This humble mindset of humility for the task the Lord gave Paul is the deep underscore of Paul’s statement, “For I decided to know nothing among you except Jesus Christ and Him crucified.” Nothing else matters. Among Christians, Paul is well known as being the most famous Christ-follower and preacher of all time. He accomplished incredible things with his life and spread the gospel with a passion we still look to for our model today. He boldly defended the faith, constantly took new ground for the Kingdom, and willingly laid himself aside for the betterment of the church at large. With all of his mighty works, it’s easy to forget that Paul was simply another man. He was a man with a past, with blood on his hands, a man who had fears, was lonely, was criticized, and battled against heavy emotional, physical, mental, and spiritual enemies on a constant basis. He was just a man. What made Paul such a significant player in the history of the early church rested in one thing alone, the power of the Holy Spirit. This was for a distinct purpose in the mind of God, that Paul’s hearers would know beyond a doubt that they could not put their faith in a simple human, but only on Jesus Christ. The Greek word here for “testimony” can also be translated as “secret” or “mystery”. It’s not that the story of Jesus was somehow hidden or needed to be decoded, but rather that Paul came to help the Corinthians “unpack” the truth of Christ that they might understand it and take it in as their own. The story of Jesus’ promised coming was foretold centuries before through the prophets, even dating back to the beginning of time with Adam and Eve in the Garden. Until God came as a baby, sacrificed Himself for us, and was raised to life as evidence of His victory over Sin and Death, all of the prophetic “puzzle pieces” were a bit unclear. 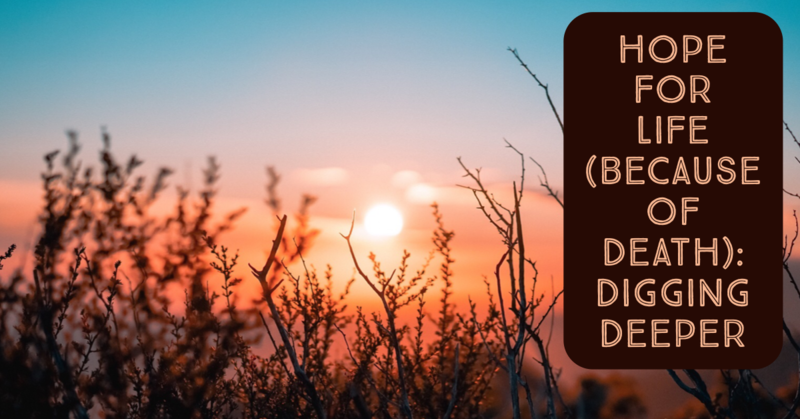 Paul is declaring that Jesus Christ, His fullness, His work on the cross on our behalf, and His resurrection are the testimony of God, His plan, and the evidence of His love. Jesus testifies to God because He is God and Paul stakes everything about His life on this testimony. When we read Scripture, it was always intended to be read and understood in a greater context. 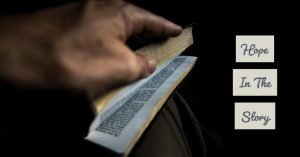 Looking at only one verse, or even a few verses, can be like looking at a black and white photo or even a dark shadow. But when we seek understanding of the passage as a whole, get to know the author and his culture, then put it in context of the rest of Scripture, we find depth, brilliant colors, and rich treasure that we can correctly apply to life as we understand more of who God is. Consider your Bible study habits or your general approach to reading God’s Word. Perhaps you skim looking for a verse to pop out at you. Maybe you open your Bible and just start reading wherever your eyes land and check out mentally after a few paragraphs. Or maybe the idea of reading the Bible feels heavy, clumsy, and awkward. That’s okay. Truly. I’ve done all of those. God has specific treasure for you, words He wants you to read, messages to impress upon your heart, and it all happens within the context of growing in how you study His Word. It’s a journey every believer is compelled to take as we learn to follow Christ. What if you and I set out to read the Bible with the same mindset that Paul determined to grow churches with? Suppose we read all of the Bible through the filter of simply wanting to know this Christ, who He was, who He is, and why He was crucified. If you had to narrow down the epicenter of your life; the one thing that mattered above all others because it was the very source of fuel for everything else in your life, what would it be? Options for this fill-in-the-blank are endless. Passion for money, desire to control, pleasing those around you, or wishing you were enough are just a few examples. I have mine, Paul had his, and you have yours. Unless each of us are willing to look in the mirror and be honest about the reality of our desperation, we have no hope of finding true confidence. There is only one thing that cannot crumble under the intense weight of a human life with emotions, passions, dreams, fears, and failures and it is the Lord Jesus Christ. Christ alone. Everything else will give way, shatter like pottery, and leave us scarred. But the confidence of Christ? There is nothing like it! It will take the broken pieces of us, and transform us into imitators of Christ, clothed in a confidence so beautiful it’s breathtaking. Not because we are wonderful, but because Christ is glorious! Seek this Jesus! Paul’s life was wrapped up in this “testimony of God”. Everything he did, the plans he made, the sacrifices he chose, it all centered around this testimony of God. 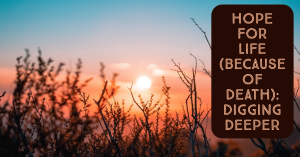 Paul encountered the risen Christ one day as he went about his business of killing Christians and those moments changes the course of Paul’s entire life. How much are you willing to surrender for the testimony of God? Is the pattern of Christ woven into the fabric of your day, your speech, your relationships, your church habits, and the words that come so quick when you’re angry? For Paul, the testimony of God had arrested the attention of his life, and nothing else mattered more. Did Paul still have a job and relationships, get tired and frustrated, feel lonely and discouraged? Yes! Take heart, sister, the testimony of God, the story of the resurrected Christ, was intended to be lived out by you and me, regular human beings, busy with life. Don’t let this testimony by another checkbox in life, let Christ be your life! 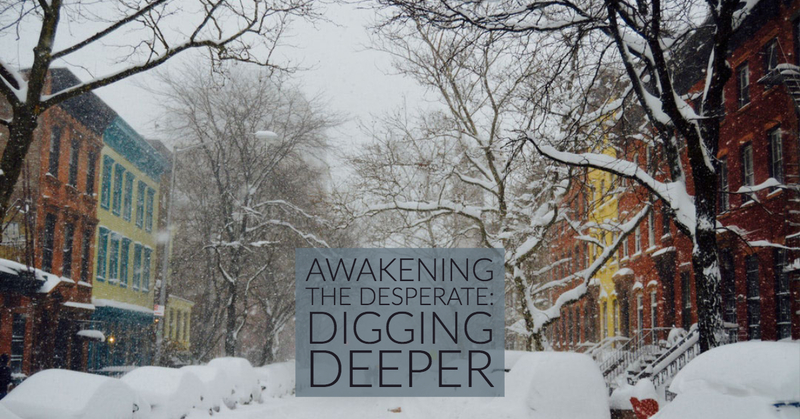 Catch up with Awakening The Desperate! This is Awaken Week One! Both have rubbed me the wrong way for a good number of years. How desperately I wanted to be good, to be found working hard, to be exceptionally smart, and for someone to recognize me as valuable. and even now it’s sharp edges surprise me at its persistence. is one I face regularly in the mirror. pushes against the heart of the One who loves me. When I was little, my younger brother was my best friend and with frequent moves he was often my only friend. Being siblings and best friends, the natural thing to do together was get into trouble. On one such occasion, Brother and I felt it would be a terribly fun idea to remove the screen from the kitchen window and jump from the single story. Having accomplished this feat with a good degree of difficulty as the frame was old, the hinges rusty, and the window sill quite filthy, we gleefully enjoyed jumping from the window and playing all sorts of imaginative games. Then, being the older, clearly wiser sister, I decided it was time to put the screen back before a parent came home to survey the sight. The trouble was, the screen obstinately refused to be placed back, seemingly enjoying its freedom as much as we had enjoyed ours. Our panic escalated as our palms grew increasingly sweaty and we batted back and forth about who’s ridiculous idea it had been in the first place to remove it. Eventually, resigned to failure, I cleverly schemed we deliver the obdurate screen to the pile of rubbish in the garden entirely out of sight. But my father discovered the screen-less window, and a re-enactment of the Garden of Eden seemed thrust upon us as my dear brother was quick to blame me as his own “Eve”. Father’s anger was unabated by any of my well-thought through defenses and my punishment was quick and sure. No amount of me (my abilities, my wit, or my stubbornness) could wrench me free from my punishment. There was no grace, there was no gentle, tender hug of forgiveness. Here, hinged between a consequence and the absolute finality that I, on my own, had no ability to deliver myself from the incoming reprimand, is found desperation. Desperate for shame to be buried. it’s about a marriage spiraling out of control. Desperate. It’s about finances that aren’t making it. Desperate. It’s about a looming health issue, a broken friendship, a son or daughter who turned away, or an ugly, festering wound from your past. Desperate. the Father God turns His face upon us. Not to shame or punish us, but to awaken us, calling us into a rich inheritance of grace. He stood in our place, took our punishment, went to Desperate for us, and offered Himself, all of Himself, as our own portion to claim as His daughters. Read those precious words again. Slowly. Notice David’s word choices. or accept the goodness of the Lord in the Land of the Living (Psalm 27:13). David chose the Lord, and good awaited him. David knew if he chose to put the Lord first, David’s heart would never be shaken and he would never again need to live in Desperate. David had the same choice each of us do. Live in Desperate or be freed in Grace. Paul’s words come back again, but now they are a sweet fragrance. no longer matter because I know that apart from Christ, “nothing good dwells in me”. Everything else pales so intensely it becomes insignificant in light of knowing Jesus Christ and Him crucified to set me free. Thanks for joining us today as we journeyed into Awaken Week One! Don’t miss out on the discussion below – we’d love to hear your thoughts! 1) When you think of Jesus coming as a baby, consider what aspects of his birth and growing up do you perhaps glorify or add a “glossy touch” to? 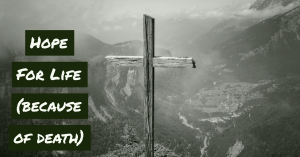 Jesus being fully human and fully God means that nothing about our human experience was different for Him than it is for us, with the exception that He never chose sin. His birth was messy, His growing up was poor, He went through puberty and struggled with acceptance amongst His peers just like every other human being. It’s one thing to know this, but another to remember and apply it when we struggle in our humanity. All of the everyday frustrations from small to big, the Savior came to be with us in the midst of them. What things are you tempted not to talk with God about because they are “too insignificant”? 2) Have you ever struggled with feeling incapable of sharing the gospel or telling others about what Jesus has done in your life? What are some of the fears that prevent you from sharing? 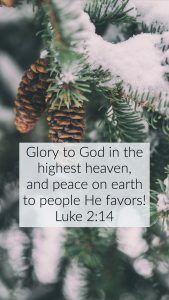 The shepherds were the first to hear of Jesus’ arrival; they were the lowest in societal rankings, yet they were also the first missionaries declaring His arrival! The least likely to tell about Jesus were the very ones God entrusted to do exactly what they never expected to do. Who would possibly listen to and believe a smelly old shepherd? It didn’t matter, they were compelled to share. Who might it impact for eternity if we were as bold as those shepherds? 3) Describe in your own words how Christ’s birth was an act of love. Go slow and really consider what it was about His birth that was so loving. If it was an act of immeasurable love, how does it affect your everyday? How might that love transform your waking, your eating, or the way you see yourself and others? Keep in mind Christ’s entire purpose in coming. Have questions or find some parts that don’t make sense? We’d love to walk with you as you think through them! Send us an email or message us on Facebook! But love your enemies, do what is good, and lend, expecting nothing in return. Then your reward will be great, and you will be children of the Most High. For he is gracious to the ungrateful and evil. Be merciful, just as your Father also is merciful. It’s so easy to take Your love for granted, Lord. You sustain us, holding all of creation together by Your hand, and yet I go about life and my focus shifts so quickly to my agenda, my plans, and me needs or wants that I forget how You uphold my existence with Your breath. Recapture my attention, Lord. Bring me, once again, to a place where I stand in awe and wonder of Your unfathomable love. Then teach me to love others as You have loved me. You are “gracious to the ungrateful and evil”, which is me, Lord. That’s me: ungrateful and evil all on my own seeking my own good and my own way. Father, Your Love Is Magnificent! And keep my heart humbly seeing how undeserving each of us are of Your love. None of us has more merit than another. Teach me to love as You have loved me. 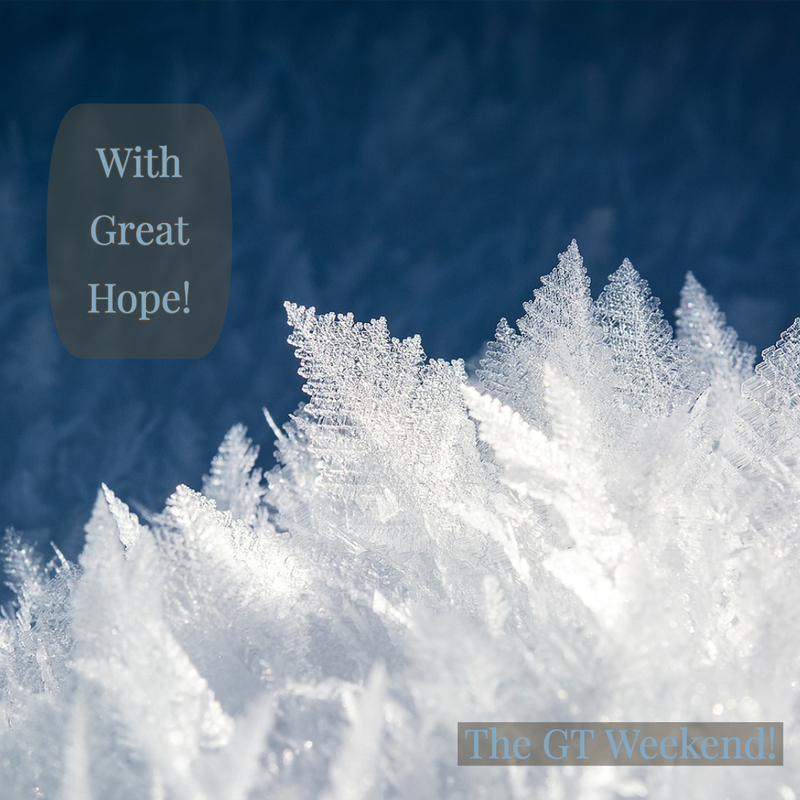 Check out Hope For Life (because of death)! 1) What does joy mean? 2) What does it mean to love as He has loved us? 3) How do we produce fruit? 9 “As the Father has loved me, I have also loved you. Remain in my love. 10 If you keep my commands you will remain in my love, just as I have kept my Father’s commands and remain in his love. 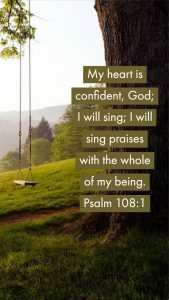 11 “I have told you these things so that my joy may be in you and your joy may be complete. 12 “This is my command: Love one another as I have loved you. 13 No one has greater love than this: to lay down his life for his friends. 14 You are my friends if you do what I command you. 15 I do not call you servants anymore, because a servant doesn’t know what his master is doing. I have called you friends, because I have made known to you everything I have heard from my Father. 16 You did not choose me, but I chose you. I appointed you to go and produce fruit and that your fruit should remain, so that whatever you ask the Father in my name, he will give you. 17 “This is what I command you: Love one another. Before looking further into this text, readers must understand John is recording a teaching of Jesus to His disciples. The Greek word John used here is ‘chara’ which translates to joy or gladness. Often times when we think of the word joy we think of happiness. According to dictionary.com, joy literally means “the emotion of great delight or happiness caused by something exceptionally good or satisfying”. Jesus tells His audience that the joy in them is complete and the same joy Jesus Himself has. However, it is not a feeling of happiness that comes and goes based on circumstances. It is a joy or delight that is constant because the joy of the Lord never ends. The word love can mean a variety of different things in Scripture depending on the context. In these verses, specifically verse 12, Jesus used the Greek word ‘agape’ which we would equate with unconditional love. He is commanding His readers to love just as He loved, which, by the way, is absolutely impossible unless His love is alive inside of us. His love is a self-sacrificing love, demanding nothing in return for Him to give it, that was ultimately displayed when Christ gave up His life on the Cross to rescue humanity from Sin. This isn’t a surface level love. This deep love is the same love Jesus is calling His readers to sacrificially and unconditionally live out to others. Jesus is not necessarily telling His readers they must physically die for someone else, but He is telling them they must love in a way that crucifies their own selfishness. We know the joy John is referring to is not a fleeting feeling because this joy is from the Lord. As believers, we have access to this same joy through the Holy Spirit who shares Jesus with us. This joy is unfailing and unending. Regardless of the storm we may be walking through, we can find joy in our lives as believers because the Spirit of God dwells within us. This joy flows from an ongoing relationship with Jesus. As we remain in fellowship with Him, His joy continues to be our joy. Just as the original readers were called to love with an unconditional, self-sacrificing love so are we. The meaning hasn’t changed since Jesus originally spoke the words. We are called to love others by willingly setting ourselves and our comforts aside. We are to live out a humble and sacrificial love by serving others before ourselves. Jesus didn’t limit this love to people we like or who are similar to us. He simply commands us to love one another as He loved us. We are called to love everyone in the same manner. As believers, we are called to set aside differences and to see people as Jesus Himself sees them and be willing to step out and love them wherever and whoever they are. In each situation God puts in our path, this love may be fleshed out differently each time, however, the one constant will be us setting aside ourselves and giving of ourselves regardless of the situation, expecting nothing in return. Once we enter into relationship with Jesus by acknowledging that He is Lord and Savior (and we are not!) and inviting Him into our lives as Lord, we are then connected to Him as the vine, the Source for growth. We become His branches to produce fruit that glorifies Him. As believers, this fruit will not look the same as another believer’s. We are to draw near to Him and ask Him to grow us as He sees fit. As we do, fruit is produced. 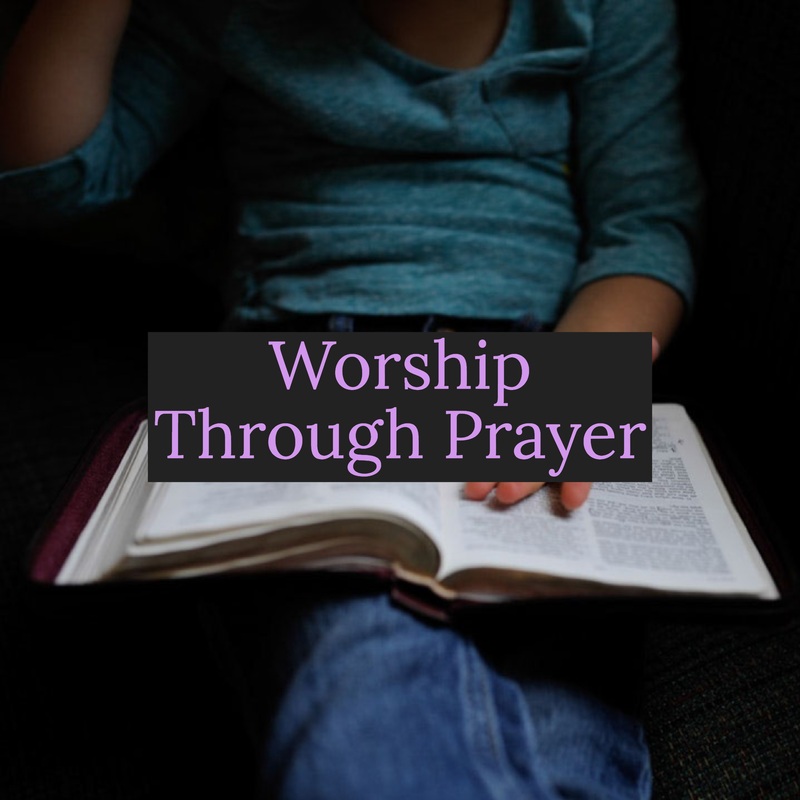 This fruit comes through answered prayers, through loving as He calls us to love, and living a life connected to the Father through Jesus by daily disciplines like Scripture reading and prayer. Fruit is simply the overflow of our relationship with the Father. We cannot expect to produce fruit and grow deep with Him if we are not investing in our relationship with Him on a regular and consistent basis. This is Glimmers Week Three! In a country where poverty and homelessness is prevalent and visible. Most of the homeless people in the Bahamas are men, but sometimes they are mothers with babies, asking for money. The five dollars in my wallet could be the way of provision for a family’s dinner. Yet, I find myself rolling up my windows while I am at a stop. Avoiding eye contact with the person knocking on my car window. I justify it with thoughts on their choices leading them here or concern for my safety. Love each other like Christ loved us. Unlike myself, where I am caught between loving myself and loving another, the Godhead was never at a loss for how to love. 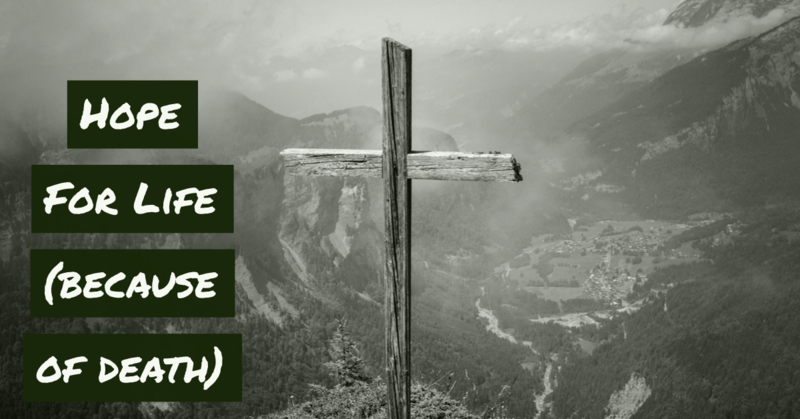 Christ Died – Surrendering His all, giving up everything, holding nothing back and coming towards us in radical love. For Us – Not for unknown strangers, but for His beloved ones, those crafted in His image. He cane for you and me. While – Progressive, continuous, perpetual. We Were Still Sinners – Us, the beloved of God, perpetually stuck in our own sin, utterly incapable of saving ourselves. In sin, we were eternally separated from the God who crafted us for relationship with Himself. We hated Him, while He loved us. He was separated from His Father, in our rightful place, that we might never again experience separation because of sin if we ask Him to forever save us. And then, after enduring a great amount of physical pain, He intentionally, with full control, gave His spirit into the hands of the Almighty, Righteous, God and Judge. because we loved our Sin more than the Savior. And there is the glimmer of hope. Us, in our inky, black sin, impossibly, eternally removed from the glorious goodness of a God of love. Watching the movie, The Passion of Christ, painted images in my mind for what Jesus’ suffering would have entailed as a human being, with flesh and blood. I watched as Jesus was scourged with the cat o’ nine tails. I watched as they mocked Him and spit on Him. I watched as they push the crown of thorns onto his head. I watched as they ridiculed His great name. I watched as they dislocated His shoulders to drive the nails through His hands. I watched as they raised the cross and lowered it into the ground. I watched as they pierced His side, to declare Him dead. I watched the blood run out of His body. And I cried I witnessed the most beautiful acts of love I’d ever seen. it was about His equality with God the Father. Christ’s death was about relationship. I watched as He asked the Father to forgive those torturing Him, including me. I watched as He accepted the thief into the kingdom as a beloved son. I watched as He took care of His mom, naming John, as her son, protector, and provider. I watched as He held the world’s sin, crying out to His Father with a heart-wrenching pain that went far, far beyond any physical wound, “My God, My God, why have You forsaken me? !” Forsaken because of sin. My sin. Your sin. I saw a love so amazing, it was beyond comprehension or description. If we’re honest, we often fail to love others like Christ loved us. We forget that others are just as sinful as us. We love conditionally, looking for what we can gain. We respond as if Jesus did not die for others, calling them beloved, just as He calls us. We are judgmental and hurtful to people who truly need Jesus’ love, just like us. But if there is no love, we have nothing. Christ’s death, and victorious resurrection, give us the ability to love as He did because of the life found through the Spirit of God who dwells within every believer. The Spirit makes us one with God, while prompting us to extend His love to people around us. Christ’s death itself was the glimmer of Hope. Hope to love a lost world. The more we learn of this radiant, unconditional love, the deeper our hearts are shifted from death to life through the Holy Spirit. Gradually, His pattern of loving, becomes our own. We learn to love well, because we have been well loved. May God be glorified and may the nations, and our neighbors, be forever changed because we love like Jesus! Thanks for joining us today as we journeyed into Glimmers Week Three! Don’t miss out on the discussion below – we’d love to hear your thoughts! Here’s a link to all past studies in Glimmers! 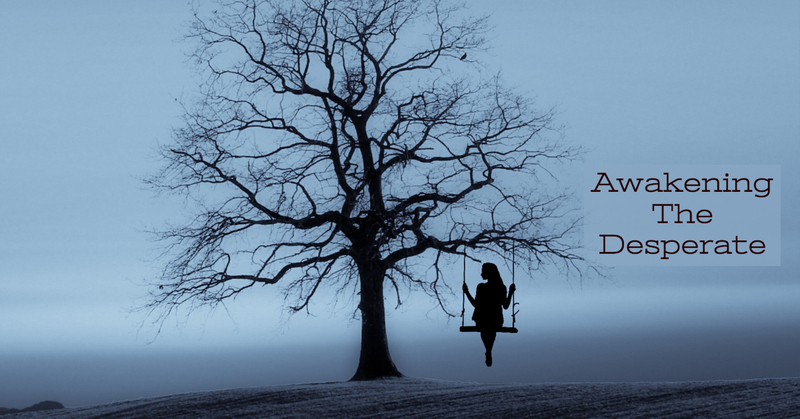 Uncomfortable truth alert: I didn’t fully grasp what hope was before I lost my daughter. Is that shocking to hear? Maybe. Is it something I don’t love to admit? Absolutely. But is it truth? A hundred times, yes. I’ll never forget the day hope caught fire for me. It was a cold Sunday, a few months after our daughter, Cadence Hope, had died. I had returned to serving on the worship team at our church, and while continuing to lead worship while working through the grieving process was the hardest thing I had ever done, it was also proving to be incredibly transformative. That morning, as I exited the platform and made my way toward the lobby, I saw my dad walking toward me. As we paused to say hello, something in his face made me lean in to listen. His eyes glinted with tears, but his face was full of unmistakable joy. I don’t think I reacted much in that moment as I processed what he said, but as his words took root and my heart took hold of the truth wrapped within, my breath caught in my throat. He had pictured the two of us. A mother and daughter, separated by physical death, yet each worshiping the only One worthy of worship. From opposite sides of eternity, each one wholly focused on Jesus. That morning, it felt like something split open inside of me, forever changing my perspective. It had absolutely nothing to do with my grief, or the fact that my dad had pictured my daughter, but everything to do with my Jesus. In that instant, some things became suddenly clear to me. we do not grieve as those who have no hope. but to know something and to know something are two very different realities. We do not grieve as those who have no hope, because we have Jesus! The hope Paul referenced isn’t about who we will or won’t see again in Heaven – it is solely and wholly about who HE is. Eternity will not be spent finding our long lost loved ones (although what rejoicing there will be on that blessed day), it will be spent worshiping HIM! Spending time in His Presence! Ascribing to Him all the glory He commands and is due! Second, my hope does not lie in the fact that one day I’ll see my daughter again (although that is wonderful), nor because I know where she is now, but because I know beyond a shadow of a doubt that my life is not about me. It is only about HIM. Regardless of my situation, circumstance, or feelings, my life will always ever point to Him. If you had asked me prior to that Sunday morning, I probably would have told you I had hope. I would have told you that I understood what it meant and why it was important. That Jesus was my Savior, and that I knew beyond a shadow of a doubt where I would spend eternity after I breathed my last. That my hope was in Jesus and the knowledge that by faith through grace, I was adopted into God’s family. And I would not have been lying to you. the hope I used to carry was a small, someday sort of hope. From Him we all receive grace upon grace. Grace and truth come only through Him, Jesus Christ. Behold, the Lamb of God, who takes away the sins of the world. John the Baptist believed God’s Word and obeyed, telling all who would listen of a Savior he had never seen. The hope John carried was the big, all-consuming fire kind of hope. The kind of hope that caused him to declare that Jesus was the Son of God, the Messiah! The kind of hope that made him call out that Jesus was the Lamb of God, twice! And we have access to that same kind of hope, Sister! Do you know how freeing it is, to know that absolutely nothing in this life compares to Jesus? That no illness, no challenge, no difficulty, no heartbreak, no grief, no loss, nothing can touch the hope that fills your heart because the God you worship is the same yesterday, today and forever?! And that the investment you put into relationship with Him daily, through studying His Word and spending time in prayer and worship, is an investment into your forever future with Him? It’s difficult to contain that kind of hope, once it catches hold in you. It would be like trying to restrain the ocean. Even if you were to try to hold it in, the waves would splash up and over your edges again and again… changing you and the atmosphere around you…and how you respond to situations and experiences in your life. That’s the kind of hope that fuels courage in the face of fear. The kind of hope that helps us lay aside our earthly belongings, our status, our treasure and our talent, and stay eternity-minded in the middle of our mess. The kind of hope that lays us bare and vulnerable so our story, however painful, however vulnerable, can be used to ignite the fire of hope in others. I sometimes get caught up in the worry that when others read things I’ve written which reference the loss of our daughter, they might think that I share things I shouldn’t, or that the topic is too weighty. Too personal. Too vulnerable. Too real. Every time I seek His heart about it, He reminds me that my story is only ever His story, and His story always pulses with a rhythm of hope. So which is it for you, Sister? Maybe you relate to the small, someday sort of hope I had. You believe, but there just doesn’t seem to be much fire in you. You want to share with others, but you don’t feel much urgency. Maybe you relate to the big, all-consuming fire kind of hope. Maybe it spills up and over so quickly you miss it, sometimes. Maybe you feel somewhere in the middle. No matter where you are, know this, dear one: HE is your hope. Regardless of your current situation or feelings, HE IS AND ALWAYS WILL BE. There is nothing you can do or say to change it, but you CAN lean into Him and ask Him to fill you with all the hope of Heaven – and He will do it! Thanks for joining us today as we journeyed into Glimmers Week Two! Don’t miss out on the discussion below – we’d love to hear your thoughts!